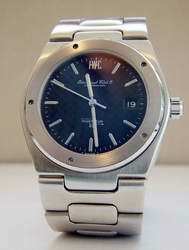 If I ever would get myself another IWC (I had a caliber 89 IWC for a short time) I will buy an Ingenieur! Larry Seiden, Marco Sch? ?nenberger and David Ter Molen wrote a very nice article on this great timepiece by IWC. You can find it here. I have a weakness for luxery sportswatches like the Audemars Piguet Royal Oak Jumbo, so I would definately get myself the IWC Ingenieur SL ‘Jumbo’ like the one below, ref.1831. If I only had the money…..